Granger constructed two parking ramps, totaling 1,040 spaces, which serve as beautiful bookends for the Consumers Energy Corporate Headquarters Building (also built by Granger) in Jackson, Michigan. Each structure has four levels with precast columns and decks and an architectural precast exterior. A total of 125 caissons were required to support the structures. This project also included two surface parking lots, roads and utility improvements and park-like site improvements along the Grand River. Granger managed all brownfield site issues for this downtown development to support Consumers Energy’s 13-story, 420,000 SF headquarters building. 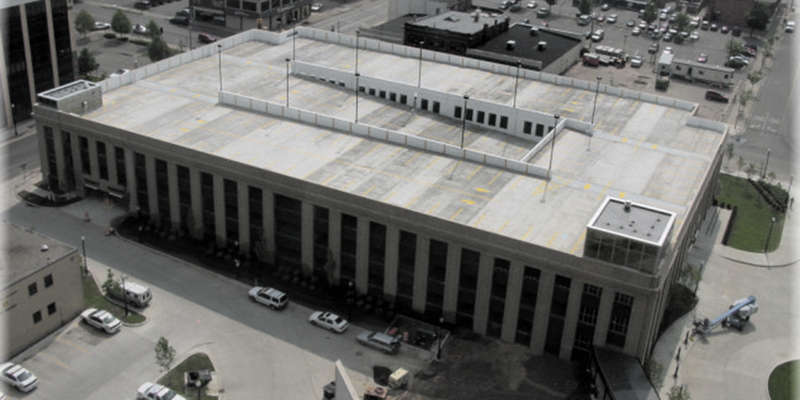 The parking structures are used by Consumers Energy during the work day and available to visitors during evenings and weekends.